It seems like diversity is one of the hottest topics right now — and it should be. It’s important to interact with people from diverse backgrounds whose opinions differ from your own. For the 40,000 students that make up Kent State University’s eight campuses, diversity unquestionably plays an important role. Since the Kent State student body comes from a multitude of backgrounds, diversity is something that we celebrate. Our campus has more than 400 student clubs and organizations to accommodate students’ various interests and provide them with additional communities. Kent State also has programs dedicated to helping students of all backgrounds, cultures and nationalities succeed during their time at the university. The leaders at Kent State understand the importance of ensuring that every student feels welcomed and valued from the moment they step foot on campus. Many faculty and staff members work with students to better diversity and inclusion efforts and encourage students to become involved and make their voices heard. Our Chapter recognizes that diversity is more than just representation but it’s also the integration of ideas, interests and more. With that in mind, we make a point to incorporate diversity through our programming and thoughtful discussion. Our speakers come from a range of industries, like healthcare, entertainment, public affairs and fashion, to reach our members’ various interests and career aspirations. We have collaborated with other student organizations to host discussions about diversity. Our first event, “Social Movements on Social Media,” was a collaboration with Black United Students (BUS) and featured a panel discussion with professors, community organizers and students who had connections to social movements on social media. The event was an opportunity for students to understand the importance of grassroots movements, the process of creating them and the large overall equation that social media is a small part of. 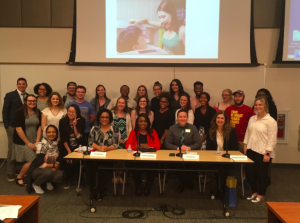 Recently, we partnered with the Kent State University School of Journalism and Mass Communication (JMC) to host a JMC Conversation, “Breaking Down Barriers: How Diversity is Represented in the Media.” The panel discussion included a journalist, public relations professional and a diversity outreach coordinator. We invited cultural, LGBTQ, journalism, political and other organizations to the event and encouraged conversation between groups. This event was incredible, allowing stories and experiences to be shared from a wide range of students. These discussions provided an outlet for thoughtful, civil discourse about diversity, the communications industry and our role in contributing to both. Our campus has numerous cultural and special interest organizations and we understand the necessity to collaborate with them in order to hear from those voices that might not be present in our Chapter. It’s important for us to recognize and embrace diverse people, ideas and conversation, both at a university level and in our Chapter; it isn’t always easy but it’s always worthwhile. We understand that with diversity comes the responsibility to promote acceptance and equality for all students and PRSSA Kent will always stand behind those values. Latisha Ellison is a senior public relations major at Kent State University and the 2017/2018 PRSSA Kent President. Follow her on Twitter or connect with her LinkedIn.